(WASHINGTON – Dec. 2013) The Ministry of Housing and Urban-Rural Development of the People’s Republic of China and China Construction Industry Association have presented a Luban Prize, the country’s premier award for design and construction, to the Huijin International Center (HIC), a project designed by international architecture/engineering firm LEO A DALY. The 30-story, 52,000-square-meter tower, which is located in the coastal city of Xiamen, serves as the headquarters for Septwolves Holding Company, a publicly traded holding company with more than 4,000 fashion stores in China. 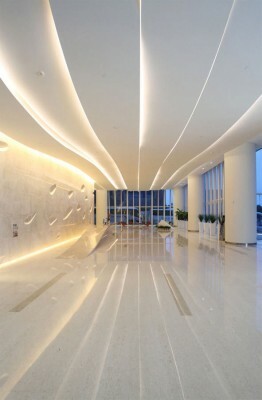 The project’s scope included the tower core and shell design, custom lobby design, chairman’s 30th-floor private apartment and gallery, the full 29th floor fit-out of the investment group’s offices, and a two-story VIP board room with views to the South China Sea. Established in 1989 and awarded biennially, the award provides recognition of architectural and engineering firms who illustrate strong quality control and project management skills and produce high-quality projects that stand the test of time. LEO A DALY designed the tower and interiors to express the culture and mission of the Septwolves Company. The tower’s soft curves emulate fabric draped on the human figure, and the sinuous bands that form the lobby’s ceiling are inspired by traditional Chinese linens rippling in the nearby South China Sea breeze. The company’s name, Seven Wolves, is expressed in the stone feature wall of the main lobby, where wolf paw prints are etched. 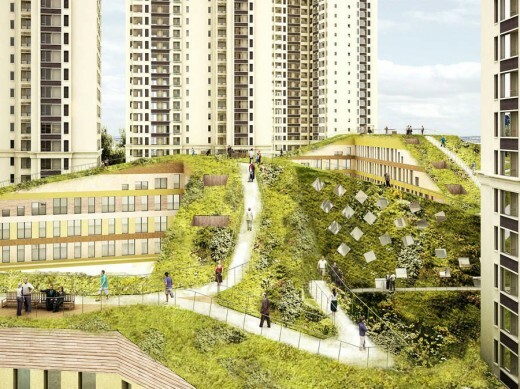 The project is the first LEED Gold, (BD+C) Core and Shell v2009 project to be certified by the USGBC in Fujian Province. The tower’s high efficiency stored-ice chiller system substantially reduces the energy consumption of the building’s highest loads, a vital feature in the region’s warm, humid climate. 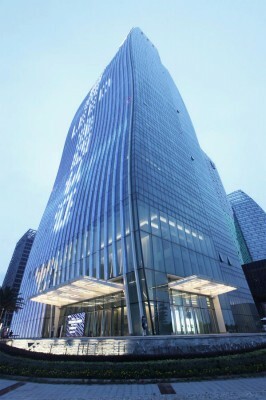 The developer of the project, Hangho Land Group Ltd., has located its headquarters on the 18th floor of the tower. The design challenge for the new Huijin International Center was to create a unique and iconic tower, while creating a multi-tenant Class A office building no taller than 130 meters. 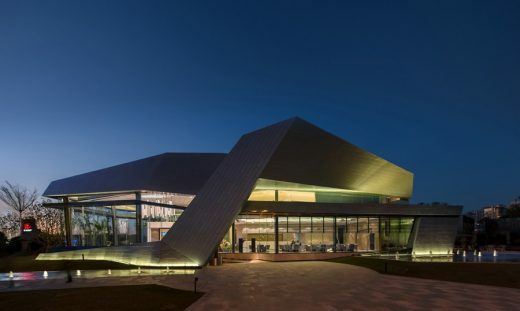 The design is conceived as a series of waves, flowing from a stone plaza to the sky. The site context adjacent to the water greatly influenced this form. The reflection of the building in the water and the water in the building creates a significant degree of site unity. The building’s shape is very unique, as it derives its form from the interplay of reflections within a series of complex repeating shapes, much like the effect of ripples on water. The use of a reflective glazing is intended to heighten this effect. 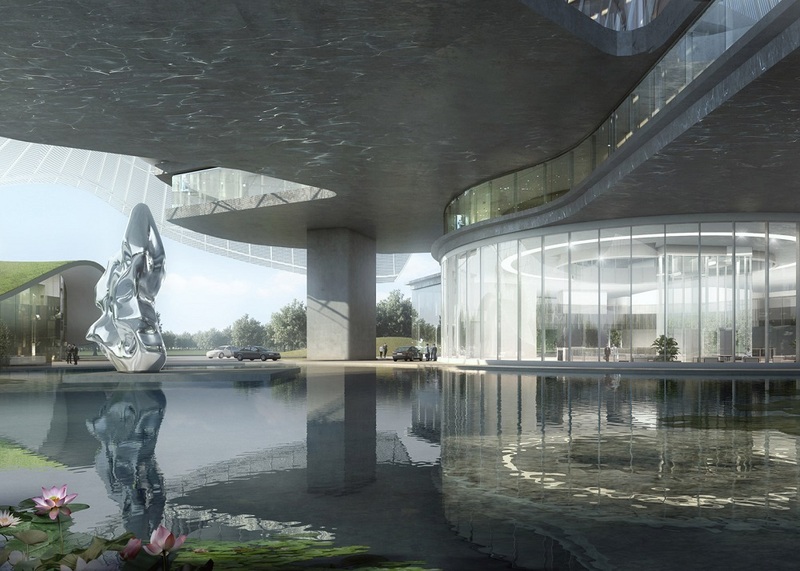 The building design is envisioned as a unique object, reflecting its important location within the office park development and on the water more than local context of north, south, east, or west. For this reason, the wave form of the building is mostly symmetrical north/south and east/west. The tower profile creates a number of different floor plans with many opportunities for corner offices. The 15th and 30th floors are set for mechanical/refuge, as well as elevator machine rooms, allowing for the maximum rentable floor area on the office levels. The site plan is divided into three areas. First, a main entrance is created to the south, with a series of steps ringed by a row of trees. The trees link with a pool on the east, an indication that this is the water side. Lastly, on the north, a drop off for automobiles is created with a smaller scale version of the southern entrance. The entry to the below grade parking also is to the north, keeping the south and east sides free for pedestrians to admire the water. Throughout, the paving pattern is serpentine, echoing the waves in the facade. It is envisioned that at night the tower would be lit from the ground, accentuating the wave forms in the facade. Additional lighting in the lobby atrium will allow for the petal-shaped base to form a counterpoint to the top after dark.